You may think this is strange but I’ve discovered that my love language is cooking. What I mean is that one of the ways that I show my family I love them is through cooking. I love it – and I especially love it when my wife and sons really, really enjoy what I’ve cooked. That is not to say that I’m a great cook – but I want to be and I am trying to learn. What makes this all the more enjoyable is that cooking isn’t so much about me (although I benefit) but about my family. Last night I stumbled across a new dish that was amazing. One of the best parts is that it combined a marinade that Sherry created a few weeks back with something I did. Perhaps even more importantly it helped to get my youngest son to eat veggies (something he does not care for). So – I thought I’d share – first because I was thrilled with the results and because of that I want to offer it. A few weeks back Sherry experimented a bit and came up with a very simple marinade – which is amazing on beef and chicken. We’ve tried it on both – grilled the meat – and it has been awesome. In a large zip lock back “dump,” as Sherry put it, Italian Seasoning, Olive Oil, and Soy Sauce. Then put in either beef or chicken. Zip that bad boy up – shake it around and then place it in the fridge for a few hours. That’s it. I promise you will not be disappointed. Strip Steak – (or Chicken): it is important to get good quality meat, well marbled. I love to grill – so I recommend grilling the marinated strip steak (or chicken). Since this is a thin cut of meat be sure to keep an eye on it. Don’t overcook – you do not want this meat to be dry (but you do want to make sure you cook it thoroughly – 165 degrees). I actually cooked my steak the day before and took it from the grill and immediately put it in an airtight container and placed it in the fridge for 24 hours. 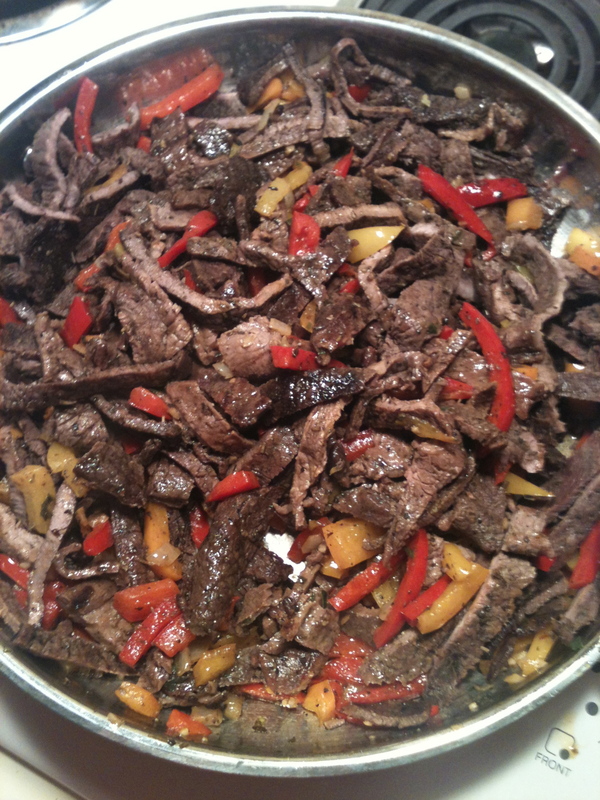 Cut up the peppers into smallish – thin strips. In a large skillet – over medium heat – melt salted butter (I like the flavor butter adds. Yes I know Olive Oil is healthier but we are going for love here). After the butter has melted toss in the veggies, garlic, basil, salt & pepper. Toss that around for a while – let those flavors mingle. Add a little of the Worchester sauce (thick if you’ve got it). When those things have cooked up add the steak (or chicken). Add a little more Worchester sauce if you want. Make sure that you mix the meat into the other ingredients. Cover it for a while and let it sit on low heat. Warm up some tortillas. Place rice and beans in the middle of the tortilla and add a little cheese – then add the fajita mix on top. Top it with sour cream if you have a mind to – or a bit of hot sauce or salsa. Serve it up to your family for an awesome meal!